Confessions of an ADD English Teacher: Who let the cat out? Once when we were camping with friends, they thought a bear was in our campsite. Not kidding. They were 60 feet away in their own site, and could still hear him snoring. When we lived in a townhouse, I could hear him while I was downstairs over the TV. For years, I used ear plugs. Now, I just sleep on the couch. The 1.5 inch thick solid oak doors between our bedroom and the living room do a passable job of blocking off the noise as long as I have the classical station playing. This is a win-win because Josie likes to snuggle up at night. D hates it when Josie snuggles up with him. I've caught her in bed next to him with her paw around his middle. 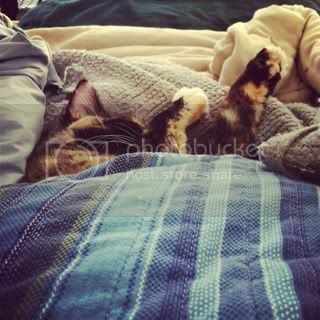 Many times, she likes to sleep under the covers, too. What can I say? She's a very pampered house cat. I love snuggling up with her at night. Her purring is the perfect white noise for me. Most nights, Leelee keeps Steve in her room. He takes great pleasure in irritating Josie. He crouches down and stalks her, seeing exactly how close he can get before she gets angry and hisses at him. Sort of like an annoying little brother. Or rebel trying to storm the castle and unseat the queen. Last night, I was in my usual spot on the couch snuggled up with Josie. Sound asleep. I had a split second of cat screaching MEOWRRRRR to jolt me awake before I had a chance to react. Steve had encroached on Josie's territory (me) by jumping up on the couch right next to my head. Josie was sleeping on my shoulder, her paws draped over me. Insert kitty drama on TOP OF MY HEAD. I ended up with claws to the hairline above my ear. I swear, for a split second I was afraid I was going to be the Weasley twin that lost an ear. So at three in the morning, I found myself in the bathroom giving my ear first aid. D thought it was hilarious. I took the girls to school this morning, came home and instead of menu planning and projects, I ate some chocolate and took a well deserved nap. Oh MY! That is crazy! You definitely did deserve that chocolate!